Gibson’s reputation might be founded on tradition, but it’s the company’s long history of innovation that keeps bringing new generations of players back to our guitars. From the invention of the archtop guitar in the 1890s, to the invention of the truss rod in the 1920s, to the release of the first electric guitar from a major manufacturer in the 1930s, to the creation of the world’s most popular humbucking pickup in the 1950s, Gibson has continually pushed the art forward. We know that “innovative” requires a whole new level of commitment for today’s demanding guitarists and the 2018 High-Performance specifications guitars deliver. While the instruments they enhance continue to express the best of Gibson’s rich history at the top of the industry, the new High-Performance II features (HP-II for short) represent the most significant and all-encompassing upgrades that we have ever applied to our guitars. What that means for the player is that Gibson’s HP-II lineup offers the best tone, playing feel, looks, and overall performance attainable in an electric guitar today. The premise for Gibson’s HP-II lineup begins by gathering together all the features and specs that the most discerning 21st century players are demanding in their guitars. The effort is fulfilled in achieving these in our flagship models, without ever taking the results out of Gibson’s wheelhouse as regards style and tone. But it all comes together with a seamlessness that also makes these guitars feel like they’ve always been there—like they are simply the most natural 21st century evolution of the same Gibson solidbody guitars that have been iconic with players for more than six decades. 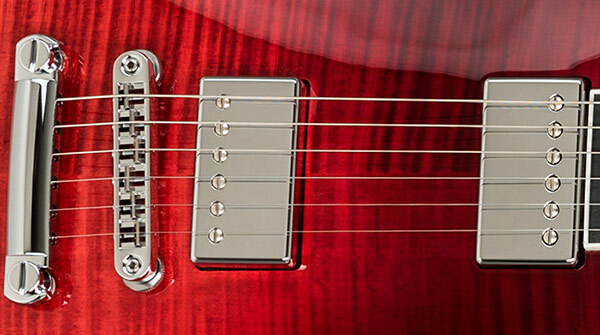 Major features of the HP-II range include redesigned neck dimensions, for optimum playing speed and comfort; advanced metal formulations, such as a titanium nut and saddles and cryogenically treated frets; Ultra-Modern weight relief where appropriate; advanced pickup designs, with highly-reconfigurable switching; and much more. Pull these together in one place, though, and the results are much greater than the sum of the parts. We haven’t forgotten the appearance of these guitars, either. 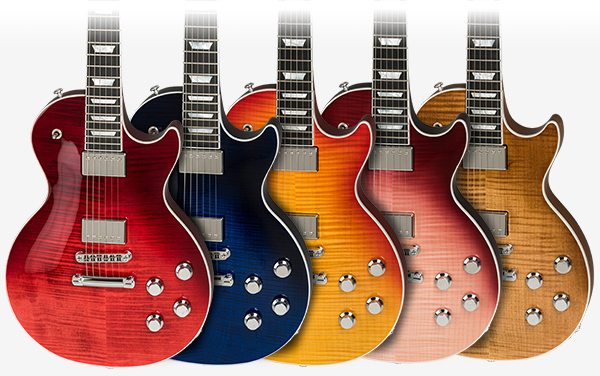 A Gibson has always looked special, too—like a guitar that inspires true pride of ownership. Taking the lineup’s visuals into the 21st century, the HP-II range features high-end appointments such as genuine chrome hardware, chrome knobs and knurled switch tips; genuine mother-of-pearl inlays, and beautifully figured maple tops where appropriate. And it all comes protected in a new composite lightweight hardshell case that merges optimum protection and an easy carry. Width: 2018 HP-II guitars use our new “soloist’s width” of 1.745" at the nut and 2.31" at the end of the fingerboard, which provides optimal room for speedy riffing and big bends. Frets: low-profile frets for speed, comfort, and accuracy are cryogenically treated for optimum wear, feel, and sustain (22 frets on the Les Paul Standard HP-II, 24 frets on the SG Standard HP-II). 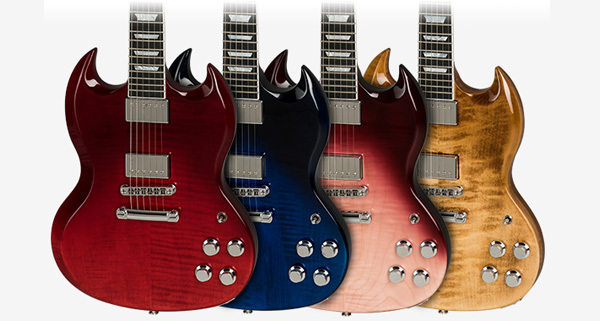 Profiles: from our popular Slim Taper neck shape on the SG Standard HP-II to our newer Asymmetrical Slim Taper on the Les Paul Standard HP-II—one of Gibson’s most ergonomic profiles ever—each neck fits sublimely in the hand for hours of playing comfort. Fingerboard: Advanced Richlite, for unparalleled durability and superb tone, with either our traditional 12" radius, or the compound radius of the 2018 Les Paul Standard HP-II. 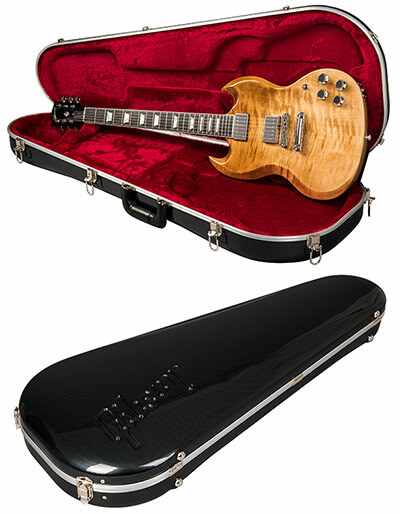 Woods: Mahogany remains our core wood, with a AAA+ figured maple top on the 2018 Les Paul Standard HP-II, and a AA figured maple top on the SG Standard HP-II, both exuding time-tested Gibson tone. Weight Relief: The 2018 Les Paul Standard HP-II benefits from our Ultra-Modern Weight Relief, a highly advanced routing pattern optimized for the best marriage of comfort and resonance. Thicker SG Body: Meanwhile, the 2018 SG Standard HP-II has a thicker body for improved balance and sustain. Finish: Gloss nitrocellulose lacquer, in a range of exclusive colors. Bridge: Tune-O-Matic bridges with titanium saddles for long wear, excellent clarity, and superb sustain. Tailpiece: Aluminum stop bar for light weight and historic resonance. Tuners: Highly efficient Grover locking tuners with kidney buttons, the best modern incarnation of this historically popular upgrade. Control knobs: Chrome Top Hats, for superior wear and appearance. Switch tips: Knurled chrome, for an easy grip. Pickups: Our most advanced modern renditions of the hallowed PAF humbuckers of the 1950s and early ’60s—a Rhythm Pro and hotter Lead Pro+ on the 2018 Les Paul Standard HP-II, and a 57 Classic and hotter Super 57 Classic on the 2018 SG Standard HP-II. Wiring: Four-conductor wiring on all humbuckers to allow versatile switching arrays. Controls: Two volume controls, two tone controls, one aviation-grade toggle switch; two push-pull volume controls on the 2018 SG Standard HP-II and four push-pull controls on the 2018 Les Paul Standard HP-II, with internal DIP switches to reconfigure near limitless switching options, including coil splitting, phase switching, and more. All 2018 HP-II models also include a Gibson Accessory Kit. Add it all together, and these are the most advanced electric guitars Gibson has ever produced, primed to meet the needs of today’s most demanding guitarists, and to make beautiful music for 2018 and beyond.